You can get the knife and gun-wielding guest character as part of the Fighters Pass for Challenger Pack 1, which includes Joker, the Mementos stage, music from the Persona series and four future DLC packs. 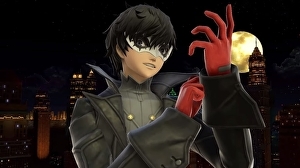 Joker’s got a counter that becomes a reflect when he’s boosted by his Persona, Arsene. As for the Mementos stage, the base colour changes depending on the music, which is a cool look.